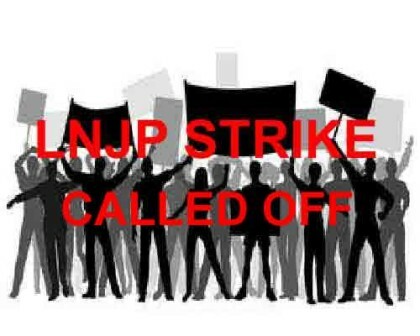 New Delhi: With the recent assault of residents of the Gynaecology Department at LNJP, and subsequently the doctors of LNJP hospital unitedly going on strike, both the police and the government finally began their efforts today, to pacify the angry doctors. Post 26th January, 2016, LNJP hospital began its day today with resident doctors getting together for strike and sitting in a Dharna. The RDA representatives as well as representatives of FORDA, Delhi on the other hand began their day running from pillar to post (a.k.a Delhi Police offices to Delhi Health Ministry offices) asking for justice for their colleagues in the Gynae Department as well as demanding protection for all concerned. In the morning, the representatives met with the DCP Central District, on action on the institutional FIR. As informed by Dr Muneesh, RDA President MAMC , today, that is on the third day of the said strike, the DCP has finally assured them that interrogation will be started on the accused today. In the meantime, with the doctors not coming back to work, desperate Dr Tempe began issuing orders that ranged from threatening interns with their degrees, PG students with their exams permission, ad-hoc resident doctors with their extension as well as asking the consultants and faculties to prepare for overtime. Deployment of 3 to 4 home guards in paediatrics casualty in each shift. Deployment of 3 to 4 home guards in main casualty in each shift. Deployment of 2 to 3 Home guards in Burns and Plastic Department in each shift. Installation of security alarm in all casualties. Installation of CCTV in casualty and other sensitive areas of the hospital at the earliest. No Punitive action should be taken against the resident doctors relating to this incident. With these promises and after subsequent meeting with the MS, Doctors of LNJP have decided to call off their strike. However, angry FORDA and LNJP RDA members, while calling off their strike for the benefit of the patients awaiting their treatment in one of the busiest hospitals of the capital, have declared a dictum for the future- Let every Assault be followed by a strike for at least one day in that hospital.